What if the boy who wouldn’t grow up did grow up? That question’s entertained in the 1991 film Hook directed by Steven Spielberg, which was an original sequel to the classic Peter and Wendy story, and it remains to the best original Peter Pan film sequel to me. 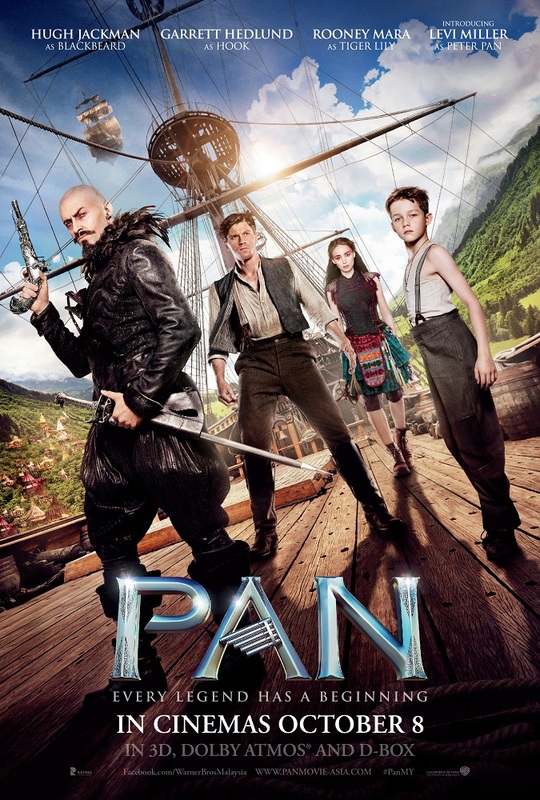 This one on the other hand, directed by Joe Wright (Anna Karenina, Pride & Prejudice), tries to be a prequel to the classic and explores the possibility of Peter Pan and Captain James Hook started out as friends when they meet each other as slaves for the evil Blackbeard in Neverland, but the film fails to fulfill its purpose with heart and sufficient adventure. 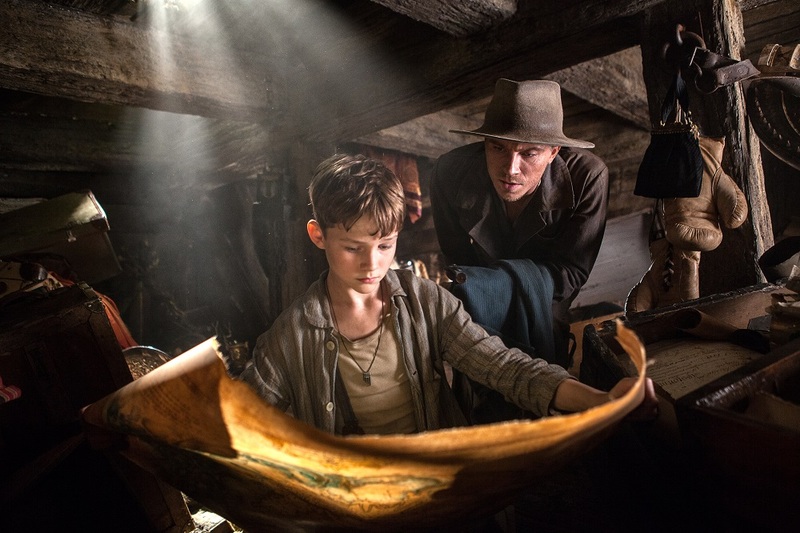 Levi Miller, a practically unknown child actor, portrays the young Peter Pan who’s left at the doorsteps of perhaps the worst nun-run orphanage around by his mother (Amanda Seyfried). The orphanage sells its kids as slaves to Neverland’s pirates, which makes me wonder if this is just a crazy coincidence or is Peter’s mother just stupid? In the first scene of Neverland, it was quite a pleasant surprise to hear Hugh Jackman (X-Men films, Les Miserables), as the antagonist Blackbeard, singing Nirvana’s Smells Like Teen Spirit along with the thousands of slaves and pirates. Although the lyrics don’t really fit, I thought the film was going to cool and all with the feature of modern rock classics, but after that there’s only The Ramone’s Blitzkrieg Pop and then no more, as though an idea was scrapped halfway through production. The script, written by Jason Fuchs (Ice Age: Continental Drift), seems like it was meant to be a theatrical play as the dialogues are just too cheesy and cringeworthy with the poor way of how scenes are executed here. Either that or it was rewritten. Every scene feels rushed and abrupt with no buildup, lousy emotional play, and limited scene time for the actors to play out the scenes properly to give their roles a true performance. It makes the Blackbeard more generic than generic cartoon villains. It was probably a good idea to feature the legendary pirate at first, but even Jackman’s theatrically committed performance couldn’t inject depth to the character or even make him scary at all. Like the film itself, no substance, no soul. And what makes the director think that it’s fine to rush scenes with contradicting dialogues such as this: “Please don’t hurt them, I beg you!”; “Don’t beg, it’s bad form to beg. Kneel before me now and I might consider stopping.”; “I’ll never kneel before you!” That’s just retarded writing enhanced by brainless directing. Some of the dialogues, mostly the ones delivered by James Hook (Garrett Hedlund), are so badly timed at the end of scenes that it made go “whaaaat was that?”. It made me confused if it’s the incredibly bad acting by Hedlund (Unbroken, Tron: Legacy), or is it just the script’s fault, or both? Although it did give me one or two chuckles, the humour and action are mostly slapstick with no real intention to impress as the director probably thought that the visuals and CGI are enough to engage. Neverland is not as satisfyingly magical as one would hope, but the visuals do look pretty. The flying ships remind of some Japanese RPG video games as well. The CGI’s inconsistency is largely contributed by the gigantic birds that looks almost as bad as the Megazord in Power Rangers: The Movie (1995) or the CGI in Chinese films. So where’s the story? 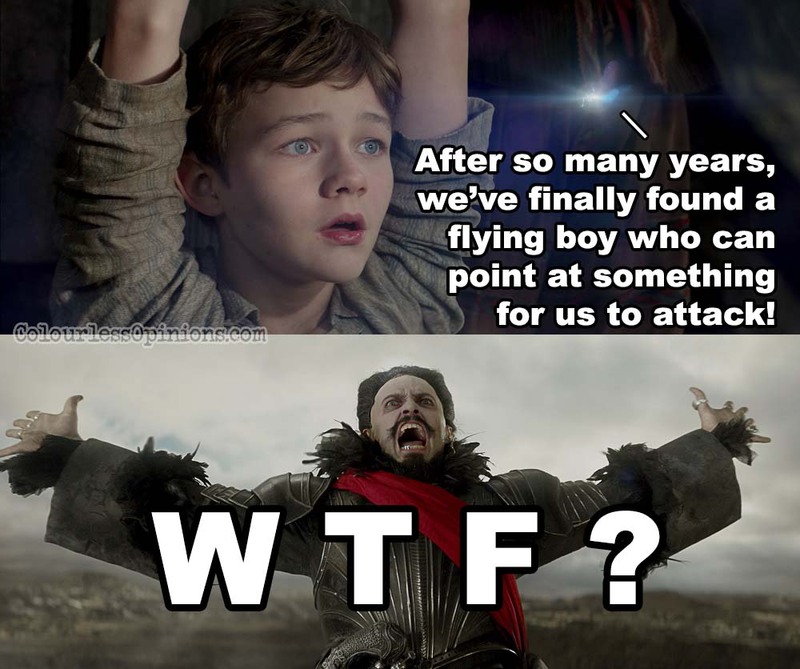 Peter Pan must learn how to fly to prove to a group of people in the forest that he’s Peter Pan? The strongest warrior among the people in the forest is an Asian dude (who disappears from the film)? They must work together to defeat an evil pirate? I bet these sound awfully familiar to those who’ve seen Hook. 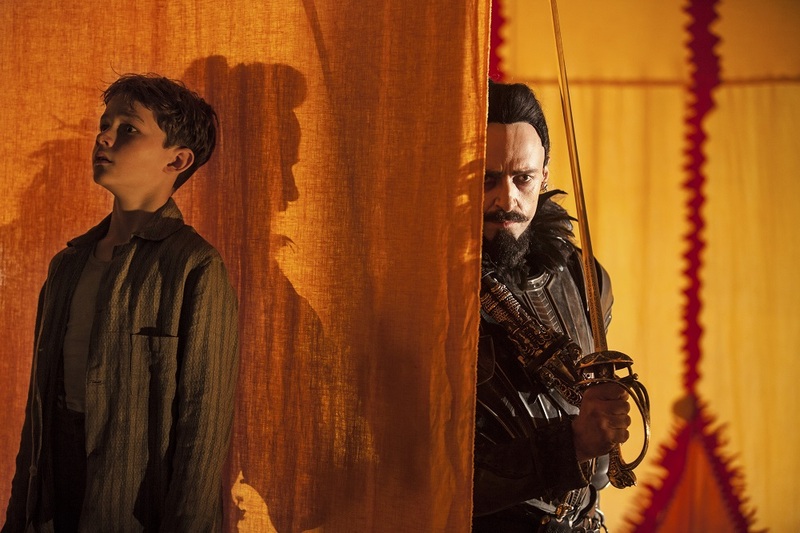 After a series of predictable cliches, Pan simply ends without explaining how Peter Pan and James Hook ultimately become enemies, which is what the fans of the classic would’ve wanted to see. Well actually, due to the lack of chemistry between Miller and Hedlund, their friendship in the film is never convincing to begin with. The worst part of the story is the fairies, who’re treated by the director or writer as nothing but a bunch of glowing bugs that somehow need to wait for a conductor to attack the fairy-consuming Blackbeard. Malaysia censorship: Nothing to cut as it’s practically like a movie for children but with forced romance, death and two modern classic rock tunes. To watch in 3D? Even if the visuals are out of this world (which it isn’t), I don’t think it’d make the experience any better. Second opinion: My girlfriend laughed at the unintentionally funny scenes with me, so needless to ask, I don’t think she liked it that much as well. Verdict: One of those terrible movies with only the visuals and one or two great actors to make it watchable.